The weekend will start on Friday night with a Driver Meet & Greet and series awards ceremony at Rock City Burgers from 6pm-8pm. Qualifying starts on Saturday morning at 9am, followed by a full day of racing until at least 6pm. The awards ceremony will follow immediately after the race. There will be a raffle and auction for the Gwendolyn Strong Foundation on Saturday night. Sunday morning, you are welcome to join the Dirt Riot staff and friends in an All Terrain Hero Race * Run * Walk with all proceeds also benefitting the Gwendolyn Strong Foundation. 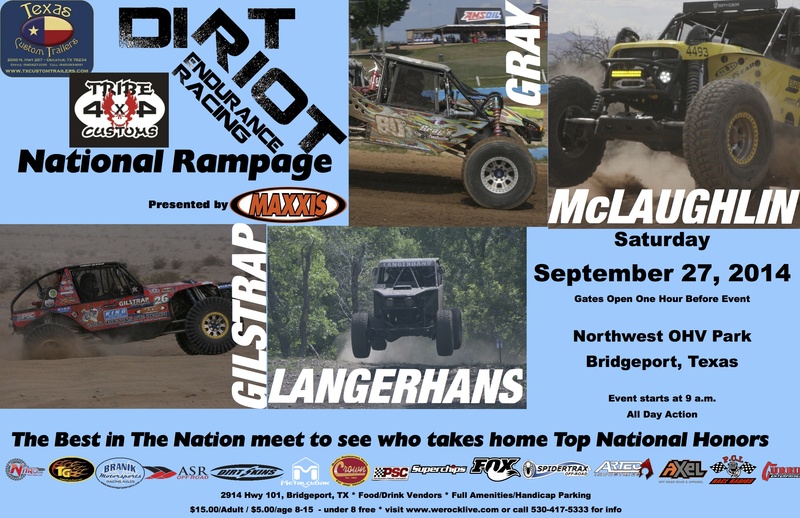 More information on times and location can be found at http://www.werocklive.com/2014/dirt-riot-2014-national-rampage. This year’s course is much different from years past. The course length could reach up to 6 miles with longer high-speed sections and a new rhythm section built by Tribe4x4. There is an expanded pit location, additional spectator viewing areas with more of the racecourse able to be seen from the start/finish area. “We are expecting perfect weather for the weekend, but it is drier than last year, so prepare for dust if anything,” said Klein. The pre-registration list includes 2014 Pro 4400 4×4 class National Points leader 80d Darrel Gray, Central Series winner Crawling Chaos Carl Langerhans, Mountain Series winner Rock Addicts Racing Chris Hoyt and Southeast Series winner Bluetorch Fabworks James Schofield. The Pro Class also includes 4WDFactory Tony Arledge, Bill Baird Motorsports Bill Baird, Bent & Twisted Racing Billy Briney, AGR Baertrax Matt Burkett, Dynamic Off-Road Cody Consford, Gilstrap Racing Shelby Gilstrap, Isenhour Motorsports Dustin Isenhour, Texas Custom Trailers Doug Jackson, D&D Motorsports Doug Kahlstrom, Money Pit Mafia Kyle Roach, Black & Blue Racing Todd Seawell, Sommertime Motorsports Chris Sommer, Rowdy Racing Rowdy Trubenbach, Twisted Monkey Racing Alex Wacker, M Town Customs Josh Walterscheid and Gilstrap Racing Clay Gilstrap. The pre-registration list for the Pro 4500 4×4 Class include currently first in National Series points Muddnutt Kevin Rants along with Duco Racing Jeff Rector and Funk-N-Fast Racing Mitch Funk. The Pro 4600 4×4 class includes the current National Points leader Rock Ware Motorsports Mathew Peterson. The pre-registration list for the more commonly on-site registered Trail Class includes Unlimited Trail drivers Marc Davis, Heck of a Deal Racing Rick Heck, K&K Krawlering Krew Kenn Hite, Mayhem Metal Neal Hunt, Kroger Racing Paul Kroger, Bad Boyz Racing Chris Langen, K&K Krawling Krew Kevin Hite, Dirty Bird Racin Gary Marx, Rolling Gnomes Paul Tyler, Money Pit Mafia Dom Vallejos and Bad Boyz Racing Nick Langen. Pre-Registered for the Modified Trail Class includes CGYS Motorsports Duane Garretson, Team Robby Bobby Roger King, Miller Racing Ryan Miller, Team SCR Texas Cody StClair, and Wilson Offroad Emma Wilson. Pre-Registered for Stock Trail includes Strange Fab Racing Tim Adkins and Rock It 4×4 Brandon Owen. Another large class at the National Rampage that is typically registered on-site, the UTV class pre-registered drivers include Joseph Chavez, Bent & Twisted Rickey Briney, Ram Off-Road Racing Shane Chiddix, Red Fish Racing Brian Fisher, H&L Frazier Ent Heath Frazier, NHD Racing Terrell Gauny, Crawling Chaos Racing Shawn Inman, Team Anarchy Andrew Johnson, Cowbell Racing Terry Kenyon, Advantage Racing Whimpy Lawson, RAM Off-Road Ray Mandel, Twisted Monkey Racing Andrew Walker, Funk-N-Fast Offroad Brad Witbeck, RAM Off-Road Shawna Mandel, Joe Bill Rogers and Casey Strickland. Spectators are encouraged to come and enjoy the day of entertainment on Saturday September 27th. Racing will be on course from 9am to 6pm, with awards immediately following. Admission is $15 for adults, $5 for ages 8-15, children 7 and under free, Military with ID $5 off and there are 20% off coupons at local establishments in town. There are vendors, food and amenities on site, and we encourage you to bring chairs and shade structures. For additional details go to http://www.werocklive.com/events/dirt-riot-national-rampage-2.